We are overrun with foreign steel. That would seem to be the point of a 25% tariff on all imported steel—we have too much of it. From 2010 to 2014, steel imports increased by 85%. You’ll hear these kind of statistics in support of that assertion, showing that US imports have skyrocketed in recent years. In this, the second in our series on the steel tariffs, we will focus on imports. 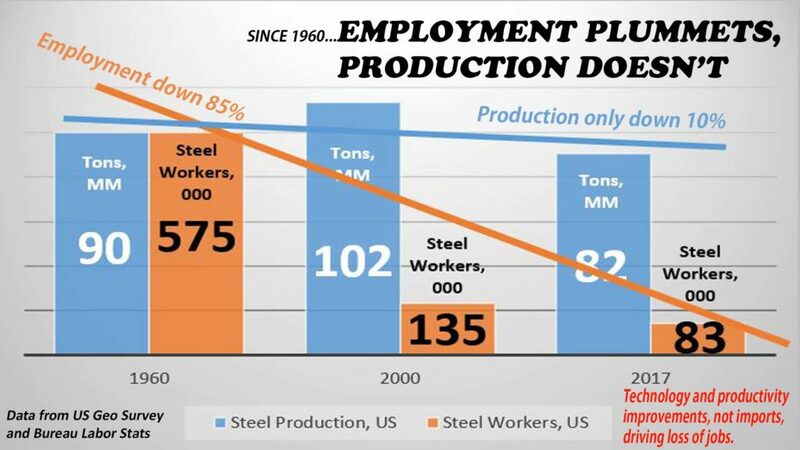 If you saw our first video, you might remember that the star of that show was this graph, , which shows that we can make 90% of the steel we made in 1960 using 15% of the people, a 600% increase in productivity. This is a pretty strong indication, to say the least, that productivity via technology improvement is a major cause of the decrease in employment in the steel industry over the last 6 decades. For imports, let’s start with this graph which shows America’s net import percentage for steel annually since 1980. 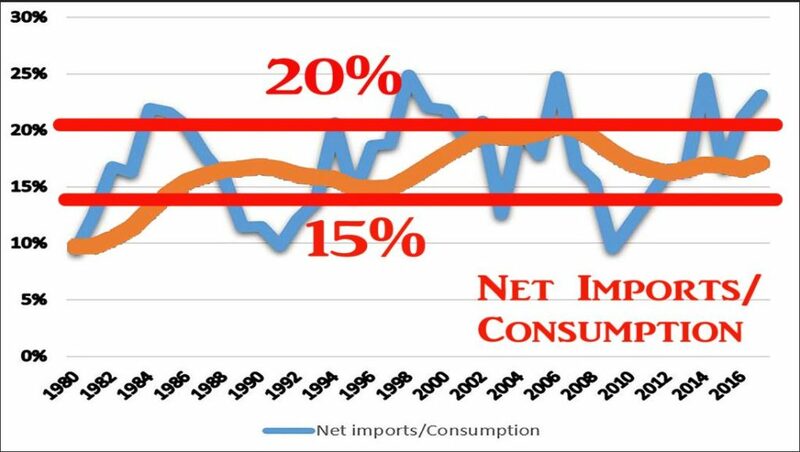 This is imports minus exports as a percentage of consumption. First note that it bounces around in a kind of cyclical fashion, which means that, just because the number moves in one direction for a few years, doesn’t mean it’s a long-term trend. This line is based on the ten year rolling average, a common technique used to smooth out the swings of a cyclical graph. You can see that for the last 40 years the rate has stayed pretty much between 15-20 percent. You can also see that, while imports are on an upswing recently, they are still within the typical range of the last forty years. Note that that 20%, even 25 or 30%, is not that high. Keep in mind, there are industries, like oil or personal computers or apparel, where the US regularly imports 50% or more (much more). So right off the bat, it is hard to look at these numbers and think there has been a deluge of imports. Now let’s drill down a bit further. 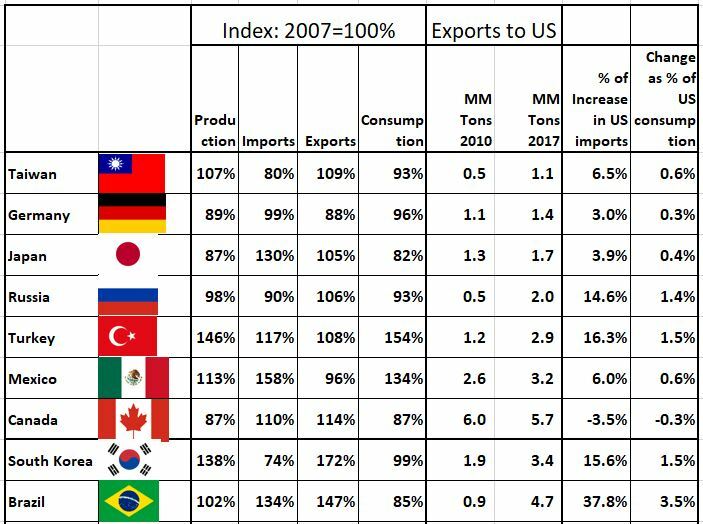 This is a list of the US’s top ten steel supplier countries, which together account for about 80% of America’s steel imports. Using 2007 as a base year, it summarizes key information relative to steel for each country. Seven of the countries stand out because, well, they don’t stand out. None of them have a significant increase in overall exports, which you would expect to see if a country was deliberately and perhaps unfairly trying to boost exports. Only one of these seven, Turkey, has increased production, significantly, but Turkey is also consuming most of that steel, so exports haven’t increased much. South Korea and Brazil are different in that both have significant increases in exports, Korea via a serious increase in production and Brazil via an increase in imports. But we have to put the impact in perspective. The amount these two increased their exports to the US comes to only 5% of US consumption, not a huge proportion, and we know that increase didn’t push the US far out of its historical pattern. Hard to see these numbers as a flood of imports. If this video has been confusing and boring, allow us to offer this explanation. First, this is statistical analysis, not any of life’s more adventurous or fun activities. We’re doing what we can. Secondly, there’s no pattern, no smoking gun. This is a smoking gun—600% increase in productivity. That’s a smoking gun. Imports don’t seem to have had that obvious an impact on the steel industry. The astute viewer will notice this video has ignored the proverbial elephant in the room, the country everyone sites as the number one problem in the steel industry—China. 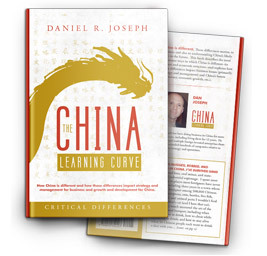 China is so big we are giving China its own video, our next one. Again, you might find the statistics to be surprising. In closing I’d like to make a point to to those of you who like the idea of the steel tariffs. Congratulations, you already won the political argument. The tariffs are in place. But in the not-too-distant future, people will be wondering whether there has been a net increase in jobs, or just higher steel prices and job losses in steel consuming industries. That’s when people might wonder why we used tariffs in the first place, and that’s when this type of analysis will be very relevant.